By winning their last two matches of the season in two different competitions, Warwickshire managed to salvage something from a disappointing season. Last Saturday they trounced Surrey in the Royal London One Day Cup final and today they completed a comprehensive win in the county championship by 237 runs over fellow relegation candidates Lancashire. Warwickshire Director of Coaching Dougie Brown, whose job might have been under threat if the Bears had lost both of those games, can sleep more easily now. But there is a big rebuilding job to be done at Edgbaston as an ageing team reaches the end of its time. “We’ve bowled well as a unit all year. For Jeetan Patel to get over 100 wickets in all competitions is outstanding. Chris Wright latterly has been outstanding. “Bringing players through has been difficult. We’ve got a crop of some really good young players. Probably in the last two or three years we’ve been guilty of not giving them the experiences they deserve. “It’s always a case of trading off performance against potential and this year, injuries have got in the way. Mark Adair would have played a lot more cricket but he’s got a stress fracture in the back. So has Aaron Thomason, who’s an extremely good all-rounder. Going back to the start of the final day, Warwickshire needed seven more Lancashire wickets in order to guarantee their top division status. They may well have hoped for cloud cover to encourage some swing for the quicker bowlers, but the sun shone and a pleasant breeze blew. Haseeb Hameed and night watchman Simon Kerrigan provided early resistance. Hameed eased a Keith Barker full toss past mid-off for four, but otherwise concentrated on immaculate defence. Though his temperament and personality may be different, he would win any Geoffrey Boycott bat-alike competition. Nevertheless, it was Hameed who went first, edging Chris Wright to Rikki Clarke at second slip. Clarke took an awkward low catch with ease, redeeming his miss of the same batsman in the first innings. Of all the cricketers who have taken at least 250 catches since the county championship began, Rikki Clarke has the best ratio of catches per match. Not a lot of people know that. Chris Wright had a big lbw appeal against Steven Croft and then another more optimistic shout for a bat/pad catch, both before the Lancashire captain had scored. By the end of his spell, Wright had figures of 14-8-8-2. As Dougie Brown pointed out, he seems latterly to have rediscovered his rhythm and form after a couple of injury-plagued seasons and is now looking like the bowler who helped Warwickshire to the championship in 2012. Steven Croft fell to Rikki Clarke’s first ball, Sam Hain at short leg taking a rebound chance diving to his left; Lancashire were now 57-5. This became 64-6 when Liam Livingstone edged Jeetan Patel to Trott at second slip. After lunch, it was Patel again who at last dislodged Kerrigan, Rikki Clarke taking a neat slip catch. The adhesive night watchman had lasted 117 balls for just ten runs. It was hardly an effort to set the pulses racing but he managed to shame some of his batting colleagues. Rikki Clarke was quickly in the action again, skittling both Jordan Clark and Tom Bailey with good length deliveries that beat defensive pushes. Although Arron Lilley defiantly struck 20 runs off Jeetan Patel’s 24th over, after just 26 runs had come off the New Zealander’s previous 23, it was a last flourish. Rikki Clarke induced a mistimed push from Kyle Jarvis that was cleverly caught by Ian Westwood and Lancashire were all out for 109, with Clarke finishing on 4-20 and Patel on 3-46. It was not quite 2.00 pm and, for these two sides at least, the season was done with Warwickshire the winners by 237 runs. 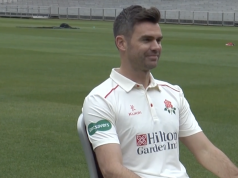 Warwickshire were safe and Lancashire were left to check regularly on the scored from the Aegeas Bowl, where Durham needed to avoid defeat in order to send Hampshire down instead of the Red Rose county.